Solomon „Sollie“ Tobias, son of Theodore Tobias, was born on July 11, 1876 in Hartford. He was only five years old when his mother Pauline Freeman disappeared from his life after his father divorced. Sollie got married around 1901 to Karolina “Lena” Oppenheimer, who was born in Angenrod, Hesse, on January 12, 1877. Her family came to America about 1884 and lived in Hartford starting in 1890. Sollie and Lena had six children. In 1921 they visited Germany with their youngest daughter Fanchon. Their first daughter, Arleen Ruth, was born on February 5, 1902. She married Maurice Bernhard “Pat” Gaylor. Arleen and Pat visited Germany with their Aunt Sophie Steiner in 1927. The couple had no children. Arleen worked for the Hartford Insurance group’s internal audit department and retired in 1967. She died on August 2, 1979 and is buried in Rose Hill Memorial Park in Rocky Hill, Connecticut. Clarabel, their second daughter, was born around 1906. She married Robert Spieske and had two children. Clarabel’s husband died in 1940 and Clarabel passed away after a brief illness on July 24, 1960. She was buried in Beth Israel Cemetery, Hartford. In July 1908 Herman was born, but the little boy died only 8 months later on March 31, 1909. The next son, Theodore H. “Teddy” Tobias, was born on May 13, 1913. He married Vera Kaminsky (1913-1962). They had two sons. After Vera died Teddy got married a second time, to Harriet D. Marks (1916-2004). Theodore was a World War II Navy veteran and a partner in the Tobias Texaco Gasoline Station in Bloomfield. He died on November 12, 1988 and was buried in Rose Hill Memorial Park, Rocky Hill. The fifth child of Sollie and Lena was Pauleen. She was born on April 30, 1915 and married Jacob Miller (1913-1974) in October 1942. They had three children. In 1993 Pauleen re-married with Stanley Karl. They lived in Florida. Pauleen died there on May 11, 2006. Fanchon Lorraine, the sixth child, was born on March 29, 1919. She married Robert J. Moore and had one daughter. Fanchon had been a legal secretary for a probate judge in Hartford, and she returned to work, as an executive secretary for the president of the Carlin Company in Wethersfield, after raising her daughter. She passed away on May 31, 2011 at the age of 92 and is buried in Rocky Hill. 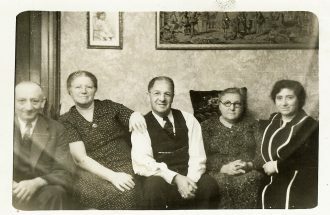 The family of Sollie and Lena Tobias played an important role in helping several German relatives get visas and escape the persecution of the Nazis. Lena started trying to do this in 1934, and discovered it was anything but easy to get the necessary papers. In October 1936 she wrote a letter to the editor of the Hartford Courant, thanking Congressman Herman P. Kopplemann for his untiring help in the matter. I think the public should know what Mr. Kopplemann has done for me as well as many kind acts he has done for others asking his aid. I have been trying for the past two years or more to get my relations over to this country from Germany with little or no success until I went to Mr. Kopplemann for his aid in the matter. I was given an interview, the matter was carefully gone over in every detail when I was assured everything possible would be done to help me, which I want the public to know was done. Half of my people are here in Hartford, having arrived last January, and the others are expected to leave Germany shortly through the untiring efforts of our Congressman Mr. Kopplemann, and busy as he was whenever I called, he was always very courious, obliging and willing to help me in any way possible. I want to speak a good word for our Congressman Mr. Kopplemann and trust you will think of him as I do when you cast your vote. The Tobias relatives they were able to help were the daughters of Gustav Tobias of Rodenbach and the children of Hermann Tobias of Hamm on Sieg, both nephews of Theodore Tobias. Sollie died after a long illness on December 20, 1946. His wife Lena lived to the age of 103 and died on March 20, 1980. They are both buried in Beth Israel Cemetery, Hartford. Lena Oppenheimer Tobias was quite a far-sighted woman when in 1934 she started helping her German relatives to emigrate. Many Jews in Germany still didn’t want to see the looming catastrophe, and the United States under President Roosevelt was far from willing to admit an indefinite number of refugees. Some articles from the Hartford Courant outline the public discussion and state of knowledge in the U.S. during these years. A number of Nationalist steel helmet leaders and many civilians were arrested in Brunswick, Germany, on charges of plotting a counter-revolutionary attempt against the Nazi party. Telegrams expressing indignation at “exaggerations” of atrocity reports were sent to America by members of the Protestant clergy, industrialists, and representatives of Jewish organizations in Germany. The greatest exodus in all their ages of wandering threatens the Jewish people today. A full third of their number, 5,000,000 or more, would have to move to new lands if the nations of Eastern Europe carry out the anti-Semitic programs they have started. Some of Poland’s politicians have demanded evacuation of the whole of that country’s 3,000,000 Jews, one tenth of the entire Polish population, although the government denies any intent at wholesale evacuation. […] Jewish sources also assert that Rumania, Lithuania, Austria Hungary, Iraq and Syria are bringing more and more pressure to bear and the Jews have nowhere to go. In the nations to which they might flee, the gates of immigration are virtually closed against them. Palestine, Israel’s ancient home, remains their great hope, but there, too, the bars are slowly going up. Even with the Holy Land open, the situation is critical. Palestine cannot begin to absorb any great number of Jews. The United States Government is forced by law to limit the number of German Jews it admits to an annual quota of 27,370. The law states that not more than 10 per cent of the total can be admitted in any one month. So far the 10 per cent is being filled.